Posted on October 6, 2017 at 9:55 am. 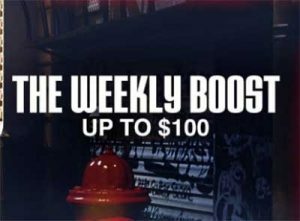 Ignition online casino offers players the chance to score up to $100 per week in the Weekly Boost. The promotion runs from Monday to Monday and refreshes by 12 pm ET. You need to be a registered player, so sign up to Ignition casino – it takes just a few minutes to enter your details which are secure – and then make a deposit using the available methods including Visa, MasterCard, Amex, instant bank transfers and bitcoin. Be sure to read the terms associated with these methods as only bitcoin offers free online casino deposits and withdrawals. You can find out more by reading our Ignition Casino review. Then make a deposit of up to $100 to have it matched by 100 percent. You will be given a bonus code, viewable in the ‘My Bonuses’ section of your account, which can be redeemed once a week, per player. You will then need to make another deposit of $100 or more to see the bonus cash appear in your account. In other words, deposit $200 over two separate deposits and receive $100 free to play with once you’ve entered the bonus code. We always recommend reading the terms and conditions so you can qualify for the bonus and avoid confusion, but we have summarised some important points below. Online casino players will need to have made a deposit in the last 90 days. If you’re new to the online casino you can sign up and claim the casino welcome bonus (there’s also a poker bonus) of up to $1000 matched by 100 percent on your first deposit. It will take some time to clear the wagering requirements for this bonus and once you’ve finished you will likely be able to claim the Weekly Boost. The sign up bonus and the Weekly Boost are subject to different wagering requirements, with the Weekly Boost playthrough requirements displayed under the My Bonuses section – it will differ depending on what tier you have climbed with Ignition Rewards. There’s a 25x wagering requirement attached to both the deposit and the bonus for the welcome offer. For both bonuses, online slots count 100 percent towards the wagering requirements, while table games contribute 60 percent for the Weekly Boost and 20 percent for the sign up bonus. Video poker contributes 30 percent to the rollover requirements for the Weekly Boost and 10 percent for the sign up bonus. Single Deck, Double Deck Blackjack, roulette, and baccarat contribute five percent for both bonuses, while craps contributes zero percent. Players must clear the playthrough requirements before claiming another Weekly Boost bonus code at Ignition Casino.